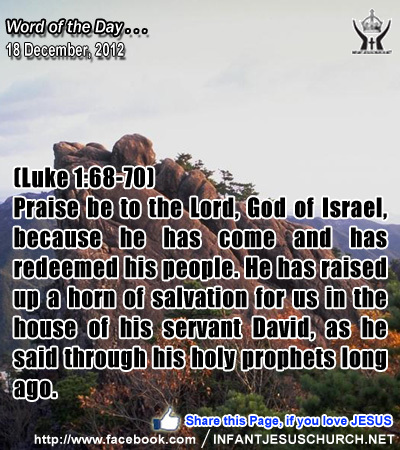 Luke 1:68-70: "Praise be to the Lord, God of Israel, because he has come and has redeemed his people. He has raised up a horn of salvation for us in the house of his servant David, as he said through his holy prophets long ago." Heavenly Father, that you keep your promises. We know we don't have to worry that you will keep your word to us; your love, character, and kindness guarantee that you will. So please help us be more faithful to you as we seek to honor our commitments and pledges to you. We know this is important to you not only because we need to learn obedience, but we also need to develop a character more consistent with your own. Thank you for hearing our heart, in Infant Jesus' name we pray. Amen. 18Now the birth of Jesus Christ took place in this way. When his mother Mary had been betrothed to Joseph, before they came together she was found to be with child of the Holy Spirit; 19and her husband Joseph, being a just man and unwilling to put her to shame, resolved to divorce her quietly. 20But as he considered this, behold, an angel of the Lord appeared to him in a dream, saying, "Joseph, son of David, do not fear to take Mary your wife, for that which is conceived in her is of the Holy Spirit; 21she will bear a son, and you shall call his name Jesus, for he will save his people from their sins." 22All this took place to fulfil what the Lord had spoken by the prophet: 23"Behold, a virgin shall conceive and bear a son, and his name shall be called Emmanuel" (which means, God with us). 24When Joseph woke from sleep, he did as the angel of the Lord commanded him; he took his wife, 25but her knew her not until she had borne a son; and he called his name Jesus. Joseph, a just and God-fearing man, did not wish to humiliate or punish his espoused wife, Mary when he discovered that she was pregnant. To all appearances she had broken their solemn pledge to be faithful and chaste to each other. Joseph, no doubt took this troubling issue to God in prayer. He was not hurried to judge or to react with hurt and anger. God rewarded him not only with direction and consolation, but with the divine guarantee that he had indeed called Joseph to be the husband of Mary and to assume a mission that would need the utmost faith, confidence, and trust in Almighty God. Joseph believed in the heavenly message to take Mary as his wife and to accept the child in her womb as the promised Messiah. Like Mary, Joseph is a model of faith for each one of us. He is a faithful witness and servant of God's recitation plan of redemption. Are we ready to believe in the promises of God, even when faced with confusing circumstances and what seems like insurmountable problems? God has not left us alone, but has brought us his only begotten Son, our Lord and Savior Jesus Christ. Let us celebrate Christmas, the feast of the manifestation, with joyful hearts and let us renew our faith and hope in God and in his redeeming work. Loving Infant Jesus, you came to save us from sin and the power of death. May we always rejoice in your salvation and trust in your plan for our life.